and easy to use, while still providing extensive share analysis. SIGNItrade Scans the market, analying over 2,500 listed securities. Access SigniTrade for free today. giving users the ability to understand and generate returns from the financial markets. This includes integrated Watchlist and Portfolio alarms. "The Portfolio management utilises email alerts with fully customisable stop losses, trailing stop losses and take profit alarms". Stratos has introduced a brand new signal system that increases the speed at which users can interpret trends. This is known as the Time Strip. This includes PE Ratios, EPS, ROI, DPS and Dividend Yield. All you need are the tools to quickly analyse the daily and historical performances of shares. SIGNITrade is easy to use with no special operating system requirements. Scan the Market for the best opportunities, and improve your portfolio’s performance. SIGNITrade enables you to create multiple spread betting and equity portfolios. SIGNITrade offers analysis and performance breakdown of each individual sector within the stock exchange. SIGNItrade analyses the user’s individual and overall portfolio performance. SIGNITrade offers customisable filters eliminating irrelevant shares that don’t meet your trading criteria. SIGNITrade offers free UK telephone support assisting you with your portfolio and trading quires. Regardless of your level of experience SIGNITrade’s new signalling system, the time-strip will provide you clear bullish, bearish and flat signals, providing entry and exit signals that are easy to learn and understand. Stratos Technology is an independent software company specialising in investment and finance related technology. SIGNITrade is the process of extensive research and development, while constantly refining our own methodologies and techniques to help our clients world-wide achieve their goals of higher returns. 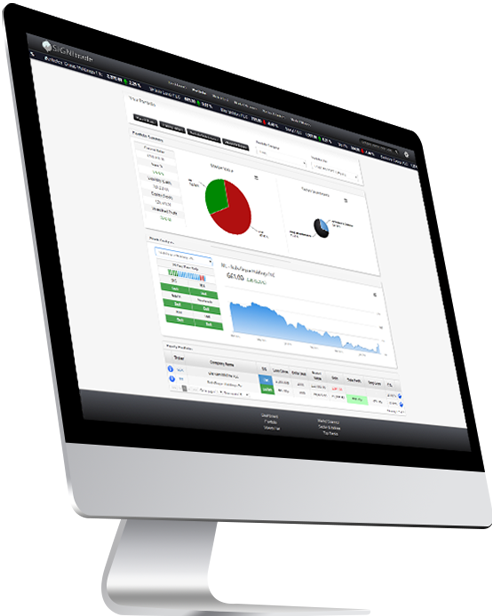 SIGNITrade is an equity focused product providing daily trading signals for all FTSE stocks. The program is easy to learn, extremely accurate and will satisfy traders of any experience level that demand the best for their trading. SIGNITrade automates end of day analysis and identifies bullish, bearish and flat signals. The signals are picked up using a rolling 20 day analysis to identify a developing trend. 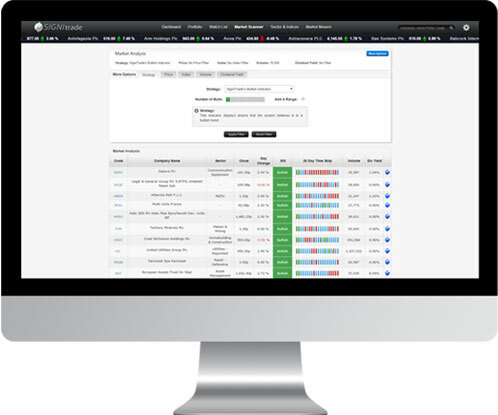 SigniTrade analyses individual and overall portfolio performance, enabling you to easily track and manage your portfolios. Learn how to successfully manage and grow your retirement, ISA or SIPP. Generate an income through improving your performance, and reducing the costs of investing. ©2016 Stratos Technology Plc. All rights reserved.